The construction and analysis of magic squares provides practice in mental arithmetic, operations with numbers, geometry, and measurement plus it encourages logical reasoning and creativity, all in a game-like setting. Furthermore, they are a powerful tool for teaching students basic addition skills since each row, column, and diagonal must add up to be the same sum. The letters of this 10 page free resource are solved in a similar way. Number tiles are arranged in such a manner that the sum of the tiles that form each straight line of the letter equal the same sum. The designated sum for the letter is written on each page as well as the number tiles to be used. Most of the three letter puzzles have more than one answer; so, students are challenged to find a variety of solutions. The activities require that the students use each number tile only once. 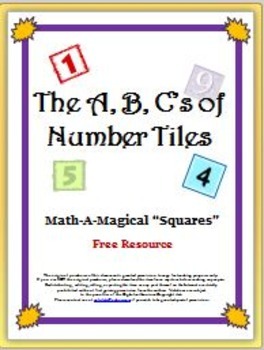 However, some of the activities will not require the use of all ten tiles; so, reading and following the directions before beginning each math-a-magical puzzle is important. Answer recording sheets are provided for the student as well as possible solutions for the teacher. A Number Tile Keeper in addition to a blackline of the number tiles is located at the end of this 10 page resource.